I watched one episode of jTBC Hidden Singer when i was in Korea and they were featuring Baek Ji Young at that time. 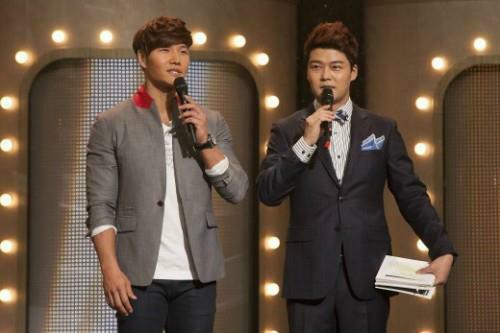 After that, the preview showed Kim Jong Kook in the next episode of Hidden Singer. Unfortunately, i will miss this episode since i will not be around in Korea to watch this show. Nonetheless, i managed to watch this episode of Hidden Singer through the website. Thanks to KJKGlobal facebook that announced the link before the premiere of the programme. The technology is so advance nowadays, we can even watch the show about the same time as it was shown in Korea. 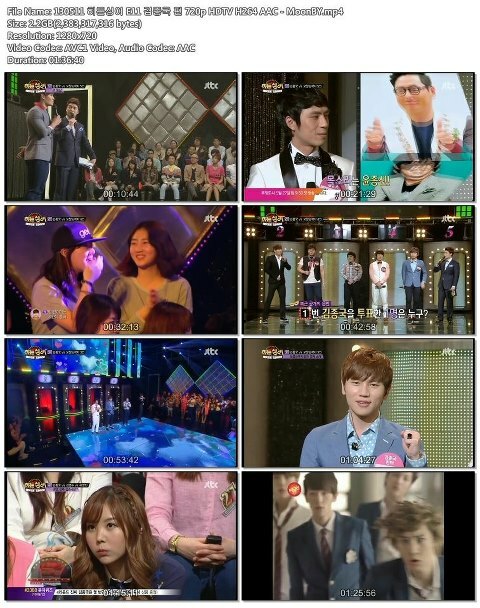 For your information jTBC Hidden Singer is shown at 11pm (K.T) every Saturday and a repeat telecast on Sunday. For those who are not familiar with the format of this programme, the main purpose is to identify the original singer (guest of the show) in the midst of the singers featured. The 1st round is to gather 6 singers behind the screen that include the singer himself. The audience were given a remote controler to vote for the singer whom they think is most probably not the guest singer. There are a total of 4 rounds and the audiences have to listen carefully to the signature songs in order to identify the singer. Each round, they will gather the most number of votes and the contestant with the most votes will be eliminated. In the final match (Round 4), the singer will compete with two finalists and stand behind the door to sing his or her song. The votes (scores) will be determined by the audience and the winner will be the one who has the most number of votes. The contestants in the programme are usually talented people who is able to sing as well as the singers. We begin the show with the MC Noh Hong Chul introducing Kim Jong Kook as Mr Capable. After that, the guests begin to talk about their impression of Kim Jong Kook and how they get to know him. One of the guest is Kim Jong-Min, who is Kim Jong Kook long time friend. I am not surprise that he is able to identify Kim Jong Kook voice. Not to forget this bald bespectacled guest - Hong Seok Cheon who is a big fan of Kim Jong Kook. Being the first open homosexual celebrity, he was rejoicing at the mention of Mr Capable. We move on to the the first round and the familiar tune of Turbo hit song - December was played. The six singers were hidden behind the door and each of them sang a few lines of the lyrics. It was interesting to see the confused facial expression of the audience as they tried to guess where is Kim Jong Kook in the midst of the sound alike voices. Wait a minute, did i hear a familar voice in door 5. Anyway, i think all the singers did well, especially the singer in door number 4 . Even though i am a 100% Kim Jong Kook fan, i am still struggling to identify Kookie voice. Finally i decided on number 3, and is there 0 vote on the door? It seems that the audience agree with me that Kim Jong Kook is at door number 3, although i doubt my listening skill. The most number of votes is at door 1 with 47 number of votes casted to this singer. 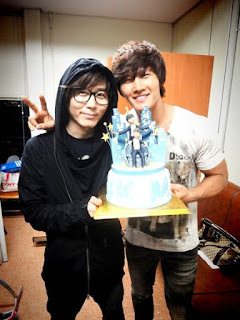 Subsequently, door number 1 opened and revealed a sound alike kim jong kook singer, so where is our kookie? In the end, it was revealed that kookie is at door number 3! Yay! The contestant that have the most number of vote was eliminated in the first round. The next song to be sang was taken from Kim Jong Kook This is Me album titled - Walking in one spot. MTV flashes of Kim Jong Kook taking off his shirt and showed off his six pack abs were shown onscreen. A female guest wondered can they still see the abs now? Kim Jong Kook was embarassed by those remarks and smiled awkwardly. Although i do not understand Korean very well, i still can grasp what is happening. The MC challenge Kim Jong Kook during the second round if the audience could not identify his voice, he have to show his muscular abs to the audience. Kim Jong Kook panicked and rejected the suggestion, while the rest of the audience were supportive of this idea. MC Noh really knows how to bargain and 'benefit' the audience with that deal. 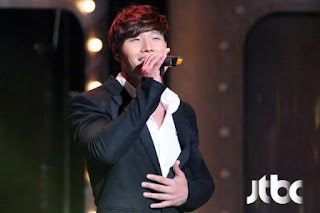 During the second round, there were 5 challengers including Kim Jong Kook standing behind the doors as they belted out - Walking in one spot. Likewise, their voices were very silimar but i eventually identified Kim Jong Kook distinctive mosquito voice. I am sure Jong Kook is at door number 1! Hey number 5 sound familiar too. The voice sounds like K.Will who is also one of my favourite singer. The door opened and i did guessed correctly but there is a greater surprise in store for me - door number 5 opened and K.Will stepped out! Wow! I can see everyone jaw-dropping when they see K.Will. Interestingly, all the contestants wore their name tag at the back. Kim Jong Kook will personally eliminate the person with the most number of votes. Haha. That was hilarious.. 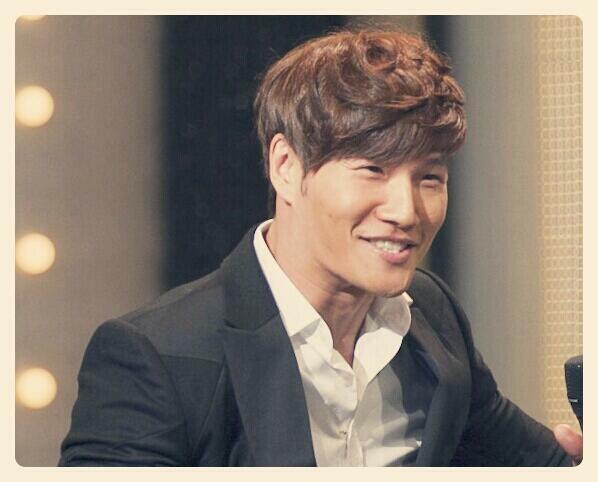 The guest spotted that Kim Jong Kook changed to a black tuxedo and he had buttoned up his suit. Does it mean that he does not want to show his abs? Anyway, it was the singer at door number 4 that won this round. Omo! Is Kim Jong Kook going to keep his words about showing his six pack abs? Trust that this man really did honor his promise as he turned around to unbutton his shirt. Look at Hong Seok Cheon expression! Some people looked on with wide open eyes while some of the female audience were shy but could not stop themselves from peeping through their fingers. Kim Jong Kook showed his abs to the camera but the audience at both side complained that they can't see. Therefore, he had to relunctantly remove the buttons again and show his abs to the audience at the side too. Scream! chocolate abs! Kim Jong Kook accidentally drop his name tag on the floor amist all the excitment and he bend down to pick it up. Hmm, that bending position was a little awkward because of those muscles and the tuxedo seem to be too tight for him. MC Noh did not let go of this opportunity to tease him as he took the name tag from him and threw it back before asking Jong Kook to pick it up again. I like Jong Kook reaction as he sat down on the floor and picked up the name tag. Haha.. I was reminded of the famous phrase by Yoo Jae Suk saying,"You build up those muscles to pick up the name tag?" The next song is Kim Jong Kook classic hit - Loveable. 3 contestants and Kim Jong Kook stood behind the doors and they sang the song remarkably well. 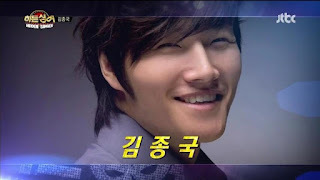 This time round not only did i managed to identify Kim Jong Kook voice, i was able to identify K.Will voice too. I am so glad that my two favourite singers were featured in the same music programme. K.Will proved to be a cute comedian with his funny antics and expression. 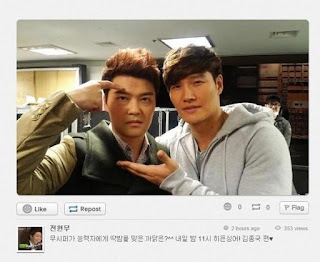 He is trying to impersonate Kim Jong Kook! The first contestant told Kim Jong Kook that he like his character in Running Man as Spartakooks and that his favourite song is - Letter. He requested to sing the song with him. Wow! That was a really good collaboration and i was blown away by their voices. It was funny how they skipped K. Will turn and talk to the other contestant beside him. This Kim Byung Man look alike contestant said that he is strong like Kim Jong Kook in Running Man. He claimed that he is able to lift Kim Jong Kook and he did exactly that as he bend down and carried Kim Jong Kook up by his legs. Now it was left with K.Will and MC Noh said that he is going to dance. Back to the dance floor as Kim Jong-Min, Kim Jong Kook and K.Will stood infront and dance to Turbo hits - Black cat and Twist King. Woohoo! bring back the old school! They finally introduce K.Will as one of the contestant and MC Noh begins to bicker with him again. I like it when K.Will imitate a few singers and a cartoon character very well. Then, he challenge MC Noh to sing like him and the latter failed terribly. Ha. Finally, time to announce who will be eliminated from the final round. MC Noh asked Kim Jong Kook who will be eliminated in this round and he jokingly replied, "Contestant number 2 (K.Will)." Indeed, K.Will name tag was removed just like the rest and he went back to his seat. 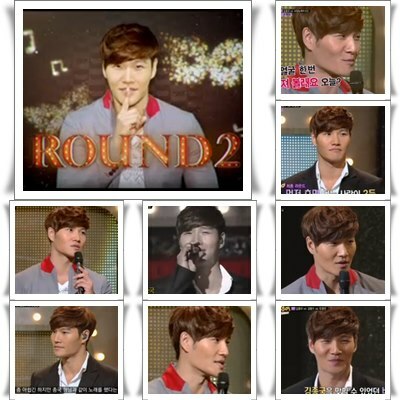 Finally, the fourth round to determine who is the winner and there were two contestants competing with Kim Jong Kook. The last song is - Han Namja (One Man) which is a meaningful song for Kim Jong Kook as this is the song which helped him gained popularity after he became a solo singer. Kim Jong-Min was asked to comment and he accidentally made a mistake when he called Jong Kook hyung by his name. Angered by the mistake, Kim Jong Kook walked towards Jong-Min but was stop by Hong Seok Cheon. Look at where you place your hand! That was sneaky of you to place your hand on - Jong Kook oppa chest!